So just about a year ago, I boldly stated that I’d solved the secret of Monkey Island. In truth, all I did was finally get an ingame joke that had gone over my head all these years. But this time, I mean it. 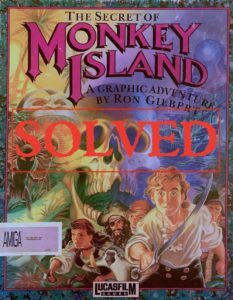 I think I’ve actually discovered something significantly game-changing about Monkey Island that I’ve never seen discussed elsewhere. First, some backstory. Yes, the original game was called The Secret of Monkey Island, and yes, the game revealed that the ghost pirate LeChuck had been hiding out on Monkey Island, which could, clearly, be considered the island’s secret. But the series creator, Ron Gilbert, has claimed that there actually is another, greater secret—one meant to be revealed in the trilogy’s never-created final chapter. So, what’s the true secret of Monkey Island? Some days I feared we might never know. I did have hope a few years back—albeit briefly—when Gilbert announced the release of a non-Monkey Island pirate game called Scurvy Scallywags. It’s a fun match-three type game that revolves around the quest for the Ultimate Sea Shanty. I’d thought that just maybe Gilbert had pulled a sneaky and made this the “secret” conclusion to his Monkey Island trilogy. But no such luck. I’ve played the game through, collected all the verses for the Ultimate Sea Shanty, and aside from one very over-powered feather duster, narry a single Monkey Island reference was to be found. LeChuck’s Theme Gets All Funky-fied! Don’t bother rushing to a store, because this game is only available online. But it’s available for just about everything: XBLA, PSN, Steam, iPhone and iPad. Who says you need to watch something before making a preview/parody of it? Let me set the stage – these guys made an animation based on Tales of Monkey Island Episode 1: Launch of the Screaming Narwhal. THEN they played it. And then they made an animation of the next chapter, and THEN watched that chapter. And so on. Pretty genius if you ask me. We had given up hope, mostly. True, it remained close to our hearts, but rarely at the forefront of our minds. Some fansites remained, although others had shut down for lack of material or purpose. And those in the know? They told us time and again to give up – there would be no more Monkey Islands. Not even a full day since learning of the pending Tales of Monkey Island, and already I also learn of The Secret of Monkey Island: Special Edition. That’s right – the original game in a scene-for-scene remake with better graphics. And if you’re leary of that, at any point you can revert to the original graphics with a mere press of a button. All sorts of fun details including artwork, videos, and other monkey stuff at www.monkeyislandspecialedition.com. Also check out the blog of Monkey Island’s original creator for lots of other Monkey Island gossip. What, still not satisfied? Fine – check out the sweet new Monkey Island merchandise over at the Lucasarts Store. I, for one, am utterly flabbergasted at how now – after most of us had accepted a Monkey Island-free future – we’re being treated to this deluge of monkey madness, to say nothing of how they managed to keep this all a secret until just before the release dates. It makes me what other surprises they have in store – a movie? a line of insult-driven cutlery? premixed grog? Proving once again that denial means nothing (it seems only last week I was reading that Lucas Arts had no intention of ever revisiting the Monkey Island franchise), Tales of Monkey Island is due for release in July! I’m a lot excited, and a bit scared – the previous Monkey Island Game was the weakest of the lot, and by no small margin. And I don’t feel that 3D is the greatest medium for the series. And I have little faith that these latest ventures (yes, there will be five of them, being “eposodic installments”) will do much to rekindle Monkey Island’s roots. But all that said… MONKEY ISLAND!!! You can read more at IGN, or visit the official site at www.talesofmi.com. El Último Blog al que Irías: Converse All Star: Mêlée Edition. It’s Monkey Island custom shoes! 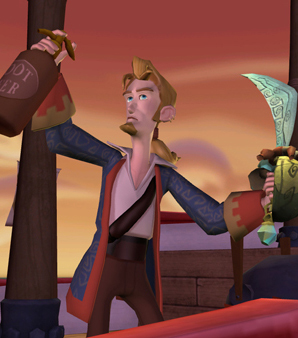 One shoe has Guybrush in a swordfight, the other portrays the night watchman of Melee Island. They don’t show what’s on the flip side of either, so I’m going to assume LeChuck in a tickle fight with Herman Toothrot on the left, and Elaine Marley in a seductive pose on the right. 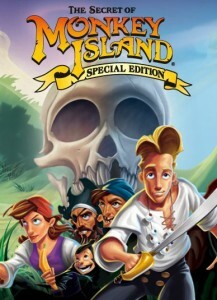 So for your naysayers who thought Monkey Island was dead, EAT IT! This may well be the greatest pirate book I’ve ever read. 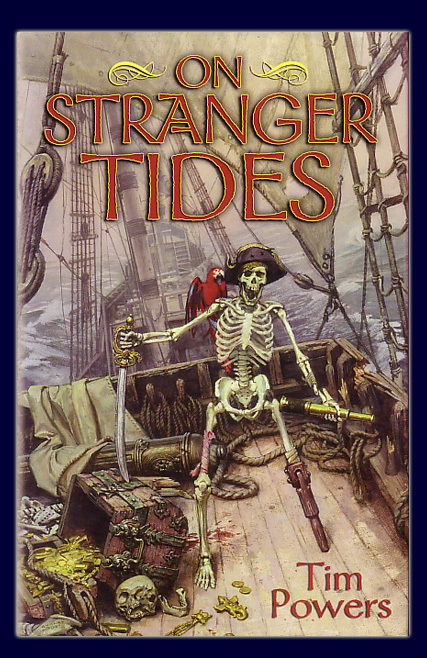 My discovery of On Stranger Tides by Tim Powers was a strange one. First published 20 years ago, it’s largely flown under the radar amongst the pirate crowds. I’d never heard its name uttered amongst fellow enthusiasts swapping their favorite reads, I’d never heard murmurs of it being made into a movie, never saw it pop up as an Amazon.com recommendation – it’s honestly a miracle I discovered it at all.